Bloggers are being urged to join the campaign of support for imprisoned Iranian blogger Mojtaba Saminejad who has been on hunger strike since 14 May. 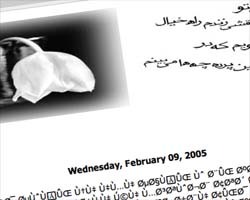 Mr Saminejad was arrested in November 2004 after writing about the arrests of three fellow bloggers on man-namanam.blogspot.com. While in prison, his blog was hijacked by hackers connected to the radical Islamist Hezbollah group. He was released on 27 January on payment of 500 million rial (£30,000) bail but rearrested on 12 February, possibly because he relaunched his blog at 8mdr8.blogspot.com. Iran has a thriving community of around 46,000 bloggers, but the government has persisted in persecuting people connected with pro-democracy writing. Press freedom group Reporters sans Frontières (RSF) has described the Iranian government's actions as the 'biggest-ever crackdown on online free expression'. The organisation wants bloggers and media sites to put pressure on the Iranian authorities by covering the plight of Mr Saminejad and other detained bloggers. "Online campaigns make a difference. The authorities don't want too much bad publicity on the web, especially before the presidential elections," said RSF spokesperson Julien Pain. "If everybody forgets about Mojtaba, he'll remain in prison. International pressure is very important, and has already led to the release of several bloggers." Mr Saminejad is being held in Tehran's Gohar Dashat prison and has complained of mistreatment. RSF claims that there is often violence between inmates and that his life is danger. A new petition has been organised by a group of Iranian bloggers calling on Ayatollah Sharoudi, head of the judicial system, to release Mr Saminejad. The international group the Committee to Protect Bloggers (CPB) organised a day of protest for Mojtaba Saminebad and fellow blogger Arash Sigarchi in February this year, and offer campaign banners and advice on writing letters to the Iranian government in support of the bloggers. "I don't think people are letting up on Mojtaba," said Curt Hopkins of CPB. "Pressure directed onto the Iranian government resulted in part in the release on bail of Arash Sigarchi. A combination of things, including internal and external pressure, can have an effect."